The barbute has undergone many changes since it first hit the field of war in the 15th century. This Visored Barbuta Helmet expands upon the original design by adding an effective visor, which doubles your protection and makes for an intimidating sight. Originally, the barbute, or barbuta in Italian, was a visorless war helm that was distinctive for its T or V-shaped opening, which gave the wearer a clear field of vision. This helmets design is supremely versatile, offering a few options on how to wear it. You can put it on visor and all. The visor can be opened in two different ways, as it can be rotated up, or one pin on the right side of the helmet can be pulled, allowing the helmet to rotate off to the side (the pin can even be left open, as the helmet features a hook closure for keeping the helm secured in its closed position). You can also pull the pins on both sides of the helmet to remove the visor entirely. The helmet is crafted from quality steel and features an incredible looking polished metal finish. The interior of the helmet features a liner, both for comfort and for making small adjustments to size. 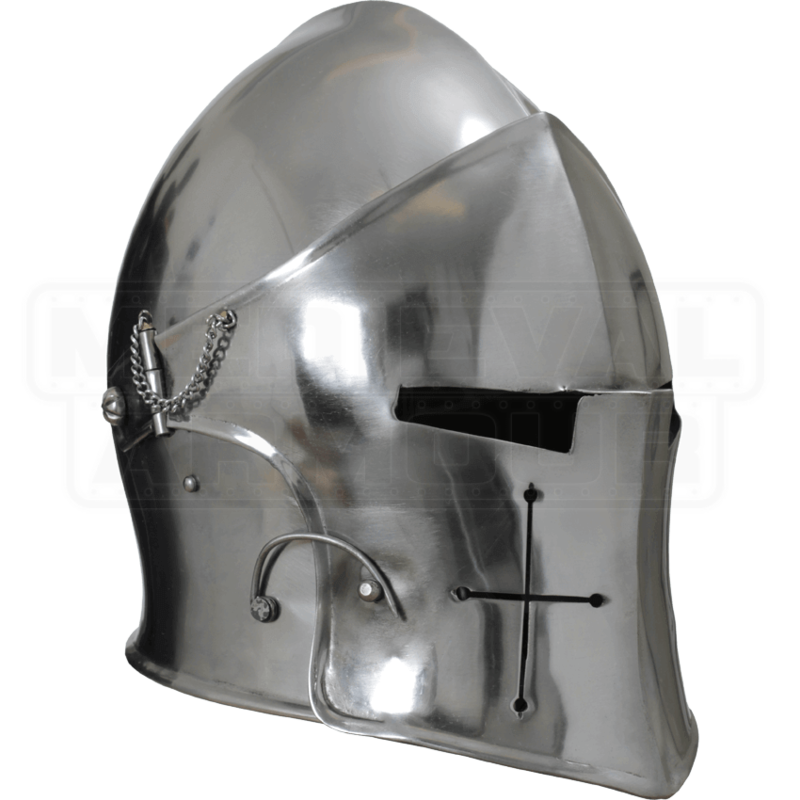 It is a full-sized replica helmet that is fully wearable, and when worn, it stands up rather well to the rigors and impacts experienced during the course of LARP combat and light reenactment. Medium: Fits a 23 to 26 inch head circumference. Weighs 3.5 lbs. Large: Fits a 24 to 28 inch head circumference. Weighs 4.4 lbs. Fits on my head well, not too heavy either. Bought this helmet for my work as an airsoft referee to protect my head. Does very well when combined with the proper padding. However mine arrived with rust on the inside, however I was able to fix this myself, and epoxy in some mesh over the eyes for greater protection. It will dent, but can take the hit before you are injured, as I had a polypropolene hatchet slammed into the helmet's upper side. Decent helmet, could be cheaper, but usable.